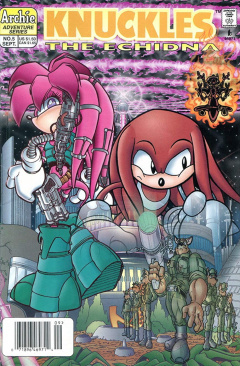 Knuckles the Echidna 5 is the fifth issue of the Knuckles the Echidna comic. This comic features one story: "Fallout", the second part of the Lost Paradise arc. In the meantime, Knuckles and Julie-Su are led by the Echidna Security Team and Constable Remington into the security center of Echidnapolis. They both demand some answers, wanting to know why they have been arrested for questioning, but Remington remains silent. Archimedes, who is tagging along, believes that they will get their answers in due time, since the Constable seems reasonable. Led along a corridor to a room, Remington finally speaks, apologizing to Knuckles and acknowledging him as Guardian, but notes that they are in desperate times. They enter the room, where Knuckles and Julie-Su sit down at a desk, while Knuckles says that he would prefer to be called by his name and not Guardian. Remington, however, would rather call him by his title due to being a superior. Knuckles doesn't want to be a superior, thinking this his job is ordinary. Once sat down, Remington pulls out a remote, retorting that Knuckles is far from ordinary. He presses a button on the remote, opening the floor under the two echidna's chairs, sending them falling into the room below. Knuckles and Julie-Su are separated, with Knuckles falling with Archimedes down a long tube, still on the chair. They come to an abrupt stop on the ground below, as the chair cushions the fall. They open their eyes, while a door opens in front of them, but Julie-Su is nowhere to be seen. Knuckles gets up, with Archimedes on his shoulder, entering a very comfortable and high-tech lounge. Knuckles, suspicious of what Archimedes knows, asks him if he's ever been here, but even Archimedes doesn't know. They cross the room to another door, where a being speaks, claiming to not be a foe, and even more than a friend. Outside in echidnapolis, the echidnas panic as they see transparent dingoes appearing out of nowhere. On the other hand, dingoes, in their own city, see the same echidnas, though transparent, in their city. One of the echidnas runs in the building he is in to report to his superior, General Stryker. With echidnas involved, the dingo knows that something is up. He slams into the General's room, but before he can report the transparent echidnas, the giant General Stryker, staring out his office's window, is already aware of their strange appearances. The burly general sits down, angry with the echidnas and their experiments. He orders the officer, Gerbil, to assemble an elite team of commandos to prepare an assault at a moment's notice. Gerbil salutes and leaves, while Stryker looks out his office again, contemplating their future battle. In the unknown room, Knuckles is shocked as he sees the being appear out of the room: an old echidna Guardian in a wheelchair. Knuckles also realizes that they must be related, thinking he is his grandfather, but the echidna reveals he is his great-grandfather...seven generations removed. The old Guardian realizes that, with Knuckles arrival, something must be wrong. Helping the old echidna out, Knuckles pushes his wheelchair as they walk down a long corridor, which the echidna explains should've only been a memory to Knuckles, but he will explain everything. They enter a large room with many monitors and high-tech gadgets; the echidna's inner sanctum. He orders Knuckles to press a green button on a nearby console, revealing a box containing a set of many discs. He removes the first disc and puts it in the console. The discs contain logs of the echidna's tenure as a Guardian from almost 200 years prior. A video starts, showing the echidna in his young years, introducing himself as Hawking, the same echidna as on the statue Knuckles and Julie-Su found earlier. The log entry, log 366, describes and shows Hawking's search of storage depots, finding five broken into thus far but unable to find the looters. However, after hearing a noise, he knew that they weren't far away. He takes flight into the sky, as numerous troop transport vehicles enter the area. Using the element of surprise, Hawking flies down and intercepts one of the vehicles, finding a dingo at the wheel. He punches the dingo out and turns the wheel to send the transport careening off a nearby cliff. The resulting crash deals a massive explosion, making Hawking realize that they are carrying something powerful. He flies in to intercept the other transports, but the dingoes are ready, as the passengers of the transports take out their guns and start to fire on him. While the log shows Hawking dodging their fire, he describes the echidna's history with the dingoes. Even before the Floating Island was sent to the skies, the echidnas had been at war with the dingoes. He tells how there would always be a cycle of combat between the two, ultimately resulting in a period of fragile peace. The video continues, showing dingoes continuing to fire on Hawking, but missing, hitting the transport ahead. The resulting explosion cripples the convoy, as Hawking flies down to investigate, noting that the dingoes had changed, turning to more drastic measures to help their cause. The log ends, so Knuckles turns to Hawking, wondering what the problem is, since he seemed to have handled the dingoes well in his time. Hawking doesn't believe so, that the only reason the dingoes survived up to that time was due to war. Knuckles then notes that the dingoes seemed to grasp the concept of echidna technology as well. Taking out the disc with anger with his mind abilities, Hawking mentions that they could comprehend their technology, but that they had no means of innovation, only wanting the technology and never thinking of what they could do with it. Using his mind, he takes out another disc and puts it in the console, playing another log. Their ignorance nearly destroyed and eradicated Echidnapolis, especially when they tried to use weapons that hadn't been used for hundreds of years. Log entry 387 begins, showing a video of numerous missiles being launched. It then switches over to a command centre, where an older Hawking talks with another echidna, explaining that, in order to fight the dingoes, they must use the same technology to survive. Knuckles asks Hawking who the other echidna is, but Archimedes speaks up, telling him to pay attention. Hawking enters the old storage area of the echidna's technology, sealed since Edmund's time, to find the solution to their problems. During the video, Knuckles keeps interrupting, wondering why he doesn't know of what is going on in the log. Hawking takes out a controller from a box, activating it, bringing up a large emitter from the ground that pops up into the sky. He reluctantly sits down in the control seat of the emitter, seeing a video of the nuclear warheads heading right for them. He presses the button on the control console in front of him, emitting a powerful laser beam from the emitter. It hits the warheads, detonating all of them, but creating a massive amount of incoming nuclear debris. Using the emitter, he was able to activate a shield around Echidnapolis. However, due to his decision, the debris would carry nuclear fallout through the winds, reaching the other areas of the island, and the shield wouldn't hold back all the radiation either. With evacuation not an option due to the entire island being affected, he looked toward the works of Dimitri to find a solution. He found papers of Dimitri's theory that other zones existed, so he used his theories to develop the Hyper-Zone Projector. Using such a projector would send Echidnapolis and its citizens to another zone, until the fallout cleared and they could return. As Guardian of the island, he also had a responsibility for the dingoes. To prevent further conflict, he transported the dingoes of the island to another zone, separate from their's. Once they were transported, he activated the projector around Echidnapolis, sending it to another zone, and leaving barren land in its place. In another room, Julie-Su is locked up, when sirens start to go off. Constable Remington runs into her room, asking her to come with him, but she is wondering why she's been locked up. He explains it was for security reasons, but now wants her help. She reluctantly agrees, and follows him, as he reports that the dingoes have attacked, taking hostages at a housing complex on the east side of the city. They arrive at a locker, where he gives her some riot gear, noting that she will be Knuckles' representative, since she accompanied him to the city. She's confused by this, but Remington simply tells her to board their van. Driving through the city, Remington goes on further to explain that among the hostages are Lara-Le, Knuckles' mother, and her consort. From prior experiences, Remington believes that they best have the Guardian, or a representative, for consultation when related to issues regarding the Guardian's family. Their van arrives at the building, which has been cordoned off by the local security force, but many bystanders still stand around watching. Exiting the vehicle, Julie-Su notes her surprise at how well the EST is prepared for a culture that renounced technology. Remington simply notes that it's all about common sense for their department, and from resulting battles with the dingoes and the Dark Legion. They head out to get in position. Back with Knuckles, Hawking has fallen off his wheelchair due to the ground shaking. Knuckles goes over to help him, also wondering where Archimedes is. The ant is fine, fixing his hat, joking that he thought Knuckles forgot about him. Before Knuckles can help Hawking up, the old echidna puts his hand up, telling him to stand back. Using his telekinetic powers, he levitates himself back into his wheelchair. Knuckles wants to know how he did that, but Hawking, instead, rushes back into sanctum, where the large display shows the problem at hand. Knuckles can't help but be shocked at what he sees: a dingo holding his mother hostage in the Echidna Towers. Archimedes tells him to calm down; that there is likely already a plan to save her. Hawking agrees, but he asks Knuckles if he is ready to handle the job. Jenna-Lu is mentioned for the first time, by name only. The dingoes of the Floating Island, notably Gerbil and General Stryker, are introduced. Using the date figure given in issue 47 of the main Sonic the Hedgehog series, Hawking's tenure as Guardian started around the year 3035. During log entry 387, Hawking is shown wearing the same hat that Knuckles wore in the Sonic OVA. In Postcards from the Edge of the Floating Island, Knuckles reveals his age to be 15.